It's official: Sprint's first WiMax/4G phone is everything we hoped it would be. The HTC Evo combines the "perfect specimen" hardware of the Touch HD2, the Sense-on-Android smoothness of the Legend, and unprecedented download speeds. It's a beast. UPDATED: Hands on! The Evo (rumored as the Supersonic) has the much-loved 4.3-inch screen (480x800 TFT LCD), and 1GHz Snapdragon processor of the of the HTC Touch HD2. But while not even HTC's Sense UI skin could save that phone from its WinMo 6.5 underpinnings, Evo will run on the much sleeker Android 2.1. It'll be one of the first US phones to sport the latest and greatest Android OS, although Kat's already fully endorsed the 2.1 and Sense combo that runs HTC Legend in Europe. It also steps up the camera from 5MP to 8MP. Also: a front-facing camera 1.3MP camera capable of HD video recording. The emphasis on video is clear: the Evo's got HDMI out and a kickstand for full enjoyment of the HD video it's capable of streaming and recording. The phone's also got 1GB of built-in storage, along with 512MB of RAM. The demos Sprint is showing us—of video playback and Google Goggles, do show very impressive download speeds. It also runs Flash seamlessly, a mandatory point these days to differentiate from the Apple mobile products that don't. Even better? The HTC Evo will work as a hotspot for up to eight devices. No word on pricing on that yet, but it's pretty remarkable that you can run 4G speed internet from one phone that broadly. It's not kidding around, either; in a demo, it enabled the streaming of a scene from Transformers 2 through a Roku. It'll also, Sprint was happy to point out, work on an iPhone or Droid. It'll be available this summer, presumably for a truckload of cash. It's a historic moment for Sprint, in a couple of ways. First and foremost, the Evo is the first 4G phone in the US (while still capable of a 3G signal). While WiMax currently only reaches 34 million people—and isn't yet it New York, San Francisco, or Washington, DC—Sprint partner Clearwire hopes to expand coverage to up to 120 million people by the end of the year (they added seven new cities to the roster today.) And those that are covered can expect download speeds far beyond what we've become accustomed to on 3G. The announcement of the Evo, in combination with the recent addition of the Nexus One to their network, also puts Sprint in an unusual position of hardware leadership. In just a few weeks they've gone from a middling smartphone line-up to having arguably the two best Android phones on the market. Let's just say it: HTC's Evo 4G is the best Android phone out there. It may even be the best phone, period. Its combination of speed, size, and power mean that everyone else is officially playing catch-up. Some differences in the physical buttons, but otherwise the size and shape are nearly identical. The familiar HTC Sense UI skin is there, too, nestled atop Android 2.1 and impressively responsive. I can see why Kat was such a fan of the combination on the Europe-only (so far) HTC Legend. Although I didn't have much time to explore, the movement from screen to screen looked smooth and fast. The Evo also includes a convenient "helicopter view" that lets you view all of your home screens simultaneously. You'd almost think it was a tablet. And in a lot of respects, I suppose it kind of is. All of that, of course, comes without even mentioning the Evo's WiMax/4G capabilities. While the phone still makes calls over CDMA, WiMax kicks in for data. The blazing fast download speeds you get on WiMax currently aren't that widely available, but Sprint plans to cover 120 million people by the end of the year. Since the Evo won't be available until this summer at the earliest, Sprint's got time to build up the network enough to make their crown jewel actually fill out its potential. The little downloading that I was able to see was clearly a cut above. And don't forget: it can act as a Hotspot for up to eight devices. For a phone? That's not just unprecedented. That's almost unbelievable. So what do we have with the HTC Evo 4G? The best hardware. The best Android OS with the best custom UI. The best camera. The fastest download speeds. Bigger, better, faster, more. 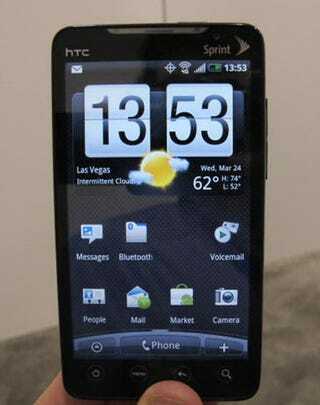 LAS VEGAS—(BUSINESS WIRE)—Sprint (NYSE: S) and HTC Corporation today announced summer availability of the world's first 3G/4G Android handset, HTC EVO 4G exclusively from Sprint. HTC EVO 4G delivers a multimedia experience at 4G speeds that is second to none, making it possible to download music, pictures, files, or videos in seconds – not minutes – and watch streaming video on the go with one of the largest pinch-to-zoom displays, at 4.3 inches, in the wireless industry. "Sprint continues to lead the 4G revolution as we introduce HTC EVO 4G to give our customers an experience that is unlike anything available in wireless to date"
Sprint 4G offers a faster wireless experience than any other U.S. national wireless carrier, and Sprint is the only national carrier offering wireless 4G service today in 27 markets. Sprint 4G delivers download speeds up to 10 times faster than 3G1, giving HTC EVO 4G the fastest data speeds of any U.S. wireless device available today. HTC EVO 4G delivers a robust list of features, including a 1GHz Qualcomm® Snapdragon™ processor ensuring a smooth and quick user experience. With dual cameras – an 8.0 megapixel auto-focus camera with HD-capable video camcorder and a forward-facing 1.3 megapixel camera – HTC EVO 4G unleashes the ability to create, stream and watch video that far surpasses expectations of what is possible on a phone today. With built-in mobile hotspot functionality, HTC EVO 4G allows up to eight Wi-Fi enabled devices to share the 4G experience. Users can easily share an Internet connection on the go with a laptop, camera, music player, game unit, video player, or any other Wi-Fi enabled device. With integrated HD video capture and 4G speeds, HTC EVO 4G makes slow uploads and grainy video a thing of the past. Now, it is possible to post high-quality video to YouTube™ or Facebook, or share moments in real time over the Internet live, via Qik. After these videos have been captured, it is easy to share them on an HDTV via an HDMI cable (sold separately). The custom Web browser is optimized for HTC EVO 4G's large display and Sprint 4G speeds to deliver a full, no-compromise Internet experience. Adobe Flash technology ensures that rich Internet content, such as embedded video and animation, are displayed the way they are meant to be seen. Pinch-to-zoom and automatic text reflowing provide easy Web page views. HTC EVO 4G features the newest version of the highly acclaimed HTC Sense user experience. Along with all of the HTC Sense features first introduced on HTC Hero, HTC EVO 4G adds a number of new features, including Friend Stream, which aggregates multiple social communication channels including Facebook and Twitter™ into one organized flow of updates; a "Leap" thumbnail view to easily switch between home screen "panels"; the ability to download new, interactive widgets; and a "polite" ringer, which quiets the ringing phone once lifted up. * Android 2.1 enables a new way to search with pictures instead of words. Google Goggles™ works with everything from books, DVDs and barcodes to landmarks, logos, artwork and even wine labels. A picture taken of the Golden Gate Bridge returns all of the information anyone would need to know about the structure. By just taking a picture of several restaurant options, HTC EVO 4G will provide restaurant reviews to ensure the best choice. * Text messaging and email composition feature built-in voice-to-text technology. By simply pressing a microphone button on the screen, messages can be composed by just speaking, making keeping in touch faster and easier than ever. * Through Android Market™, HTC EVO 4G users have access to thousands of useful applications, widgets and games to download and install on their phone, with many more to come. In addition to today's Android apps, the performance of which will be enhanced by 4G speed, application developers will be introducing new apps that take advantage of 4G power in new ways – games and communications tools and other apps that bring together video, presence and location simultaneously, and capabilities that haven't yet been imagined. For example, an application developer might create an app that allows a customer to simultaneously watch a streaming sporting event while pulling down stats and conducting a video chat with a friend. A Sprint 4G developer guide is available today from the Sprint ADP Web site http://developer.sprint.com. The Sprint 4G developer guide explains how to develop on an Android 2.1 handset and how to take advantage of 4G and unique hardware/software capabilities, including how to use a forward-facing camera in an app; how to use HDMI output; and how to build in network detection (3G, 4G or Wi-Fi) to optimize quality of data in an app. The Sprint 4G developer also will include sample apps and source code that highlight these features. It will supplement the Android 2.1 SDK. As a charter member of the Open Handset Alliance™, Sprint is actively engaged with the Android community. Sprint has employed an open Internet approach, and the Sprint Application Developer Program has been providing tools for third-party developers since Sprint first launched the Wireless Web on its phones in 2001. "Sprint and HTC have come together to propel the Android platform into the 4G world with the introduction of HTC EVO 4G," said Andy Rubin, vice president, mobile platforms at Google. "The Android platform was developed to give people unmatched mobile connectivity to the Internet. By combining this vision with the promise of Sprint's first-to-market 4G technology, HTC EVO 4G makes accessing thousands of applications from Android Market, using Google™ services like Google Goggles, Google Earth™ and the all-new Gesture Search, or simply browsing the Web faster, easier and more enjoyable than ever before." As the first national wireless carrier to test, launch and market 4G technology, Sprint made history by launching 4G in Baltimore in September 2008. Today, Sprint 4G covers more than 30 million people and expects to have up to 120 million people covered by the end of 2010. Sprint currently offers 4G service in 27 markets, including Atlanta, Baltimore, Chicago, Dallas/Ft. Worth, Las Vegas, Philadelphia, Portland, Ore., San Antonio and Seattle. Following is a comprehensive list of markets by state where Sprint 4G is currently offered: Georgia – Atlanta, Milledgeville; Hawaii – Honolulu, Maui; Idaho – Boise; Illinois – Chicago; Maryland – Baltimore; Nevada – Las Vegas; North Carolina – Charlotte, Greensboro, (along with High Point and Winston-Salem), Raleigh (along with Cary, Chapel Hill and Durham); Oregon – Portland, Salem; Pennsylvania – Philadelphia; Texas – Abilene, Amarillo, Austin, Corpus Christi, Dallas/Ft. Worth, Killeen/Temple, Lubbock, Midland/Odessa, San Antonio, Waco, Wichita Falls; Washington – Bellingham, Seattle. For more information, visit www.sprint.com/4G. In 2010, Sprint expects to launch service in multiple markets, including but not limited to, Boston, Denver, Houston, Kansas City, Minneapolis, New York City, San Francisco and Washington, D.C. Sprint is harnessing the power of 4G as the majority shareholder of Clearwire, the independent company that is building the WiMAX network. Sprint is the only national wireless carrier to offer 4G services on the Clearwire WiMAX network.